This BioMat is designed to fit perfectly on a massage table. 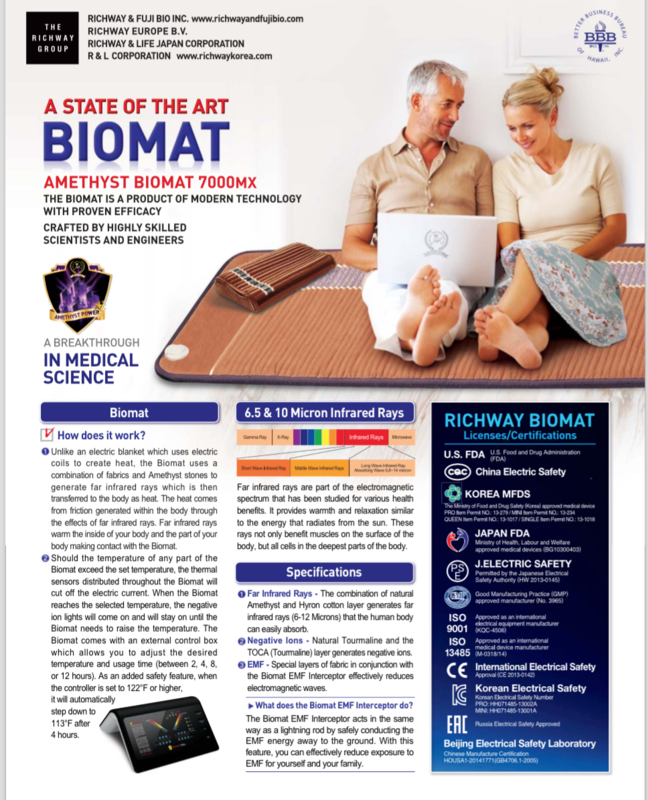 The Richway Amethyst BioMat Professional is an remarkable healing tool. BioMat spawned an industry of imitations. That indicated, Richway’s long-term strategy of product improvement year-over-year has succeeded. Modern 7000MX BioMats are the result of twenty years of continuous research and development. No other infrared pads have this history. The BioMat is the original far infrared pad. It has been and is the standard for other infrared pads. Most infrared pads are vastly superior to standard heating pads. The BioMat must be experienced to be fully appreciated. And it is the choice of professionals. It can be helpful to understand what all infrared products have in common, and what makes them different. All infrared products, including saunas and handheld devices, use a crystalline material to convert conductive heat into radiant heat. Some products use synthetic crystals such as graphite or ceramic, and some use natural crystals, such as jade, quartz, or amethyst. 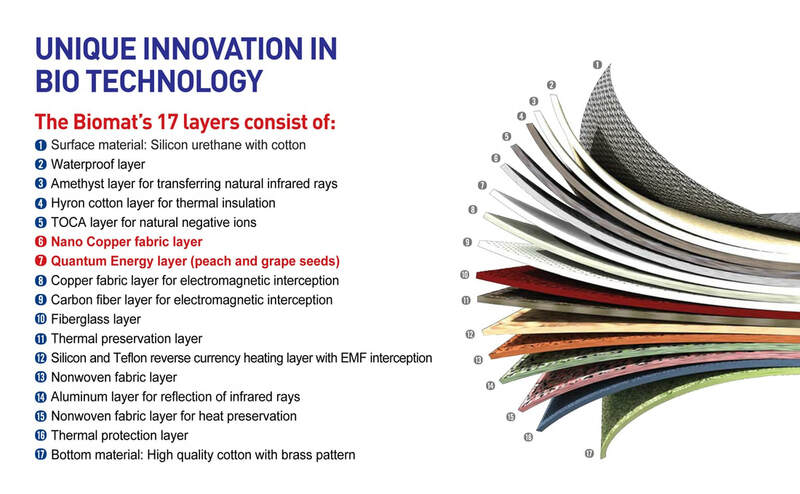 High-end infrared products tend to use natural crystals. The amount of crystal is equally important. A good infrared therapy device heats the body indirectly – the device heats the crystals, and the crystals heat the body. It feels like hot stone therapy for the whole body. To achieve the effect, the BioMat Professional contains more than 18 pounds of amethyst crystal, covering it’s entire surface. This allows it to deliver a very large amount of warmth to the body, distributed evenly throughout, rather than distributed mostly on the skin. The BioMat will become warm during use. No parts of it become hot to the touch - which is a huge sign of quality in an infrared pad. The BioMat Professional has some advantages over the Mini BioMat - due to the fact it can give a full-body treatment. The full body treatment causes more profound changes in the body, and contributes to a more transformative overall experience. However, if the tourmaline crystals are desired - to add an energizing effect, two Mini BioMats, placed end-to-end can be placed on a massage table. And, if desired, the two BioMats can be set at different temperatures. The BioMat Professional is the recommended option when the goal is whole-body treatment. For local issues, such as back pain, the Mini BioMat, or the BioBelt can often be a preferred choice because of increased portability - and their ability for easy use on a chair or couch. The BioMat Professional also makes an excellent alternative to an infrared sauna. It is more affordable, and easier to store and transport. It is used while lying down - allowing the treatment to be more relaxing. It also warms the body evenly, while allowing the head to stay cool. 700 x 1850mm / 27.55" x 72.83"